Prague is romantic, historic, beautiful and the ultimate beer lovers’ paradise. It’s also a tourist hot spot, which means when travel season rolls around, the city can be packed. To make the most of it while also minimising your impact, keep the following tips in mind. The locals will appreciate your efforts, and you’ll get a far better experience of the city and local life. For me, the most overrated attraction in Prague isn’t a sight, but a supposed tradition: absinthe. The number of locals who drink this pseudo-liquor? Zero! It’s one of the biggest tourist traps in town. Instead, the tradition here is beer, with its rich history and high standards. Do visit at least one microbrewery in the city centre; my favourite is U Dobrenskych, which makes beers with different herbs that are sooo delicious. #localsknow to avoid the busy main streets in Old Town. Instead, there is always a narrow street going the same direction from Attraction A to Attraction B — but it will be completely empty, just waiting for you. Don’t keep it waiting; take a stroll and you’ll love it. Believe me, I might meet you there. Žižkov, Holešovice, and Karlín are some of our Prague Urban Adventures team’s favourite neighbourhoods. You’ll find indie businesses and original ideas flourishing here, all crazy and beautiful at the same time. The best part is, you won’t meet many tourists in these areas, just locals — all of whom are well worth getting to know. Also, even though Prague is incredibly photogenic, remember to watch around you when you pull out that selfie stick. Prague is a great place to visit year-round. It’s true that January and February are the coldest months, but the city centre is less busy at this time, plus you can get great deals on flights and hotels. Also, you’ll be able to enjoy the Old Town Square in its full architectural beauty without all the markets — a big plus! When the crowds are in town, by far the most visited Prague sights are Prague Castle and the Charles Bridge. These places are spectacular, so you must see them, but I highly recommend going in late evening. Prague Castle closes its gates at 10pm, so no need to join the midday rush. After visiting the main seat of Czech rulers, you can go down the hill and walk over the Vltava river via the Charles Bridge. Prague Castle will be lit up and the view from the bridge is stunning. Tap water in the whole of the Czech Republic is drinkable, so no need to buy water in plastic bottles. As you walk around the city, you’ll find plenty of drinking fountains, where you can fill your reusable water bottles with perfectly drinkable and great-tasting water. Prague is not as big as you might expect, and the city is very walkable. So instead of hopping in a taxi or Uber, put on good shoes (there are cobblestones everywhere) and walk. You can also use the biking platform Rekola. You’ll recognize Rekola bikes by their pink colour. The first 15 minutes are for free; for the next 45 minutes, you pay CZK 24, which is only about EUR 1! The rental is super easy — just download the free Rekola app and start riding. Traveling around Prague is easy, as our local public transportation system is excellent (it’s also won several awards for efficacy and accessibility). You will probably appreciate the trams in the historical areas, but if your hotel is not in the city centre, the metro is the fastest option. The majority of locals use annual passes, but you’ll need to buy shorter timed tickets (you can choose from 0.5, 1.5, 24 or 72 hours). Just don’t forget to validate the ticket when you use the service for the first time. Locals don’t need to validate anything, so don’t get confused! And please don’t forget to stand on the right side of the escalator when you leave the metro. Locals are quite strict about this rule. For infrastructure fans, there’s a local initiative underway called Smart Prague, which is aimed at using technology to make the city more livable. The main topic right now is transportation and its effectiveness — even though our transit system is excellent, Prague is still a historical city and the city centre wasn’t built for cars. These initiatives should ease up city congestion. Forget about Chinese-made t-shirts that say “I love Prague” or “Prague drinking team” hoodies. Instead, visit a hidden gem full of modern art by local artists at Pragtique. It is a bit hidden in the house atrium called Platýz. As the owners say themselves, Pragtique is more than a store. It is where love for Prague meets the sense of style. I’m sure you’ll love the store just as much as we do. You can also support local businesses by booking small local apartments instead of big chain hotels. Or, get out of historical city centre and eat in neighbourhoods like Karlín, one of the most up-and-coming local ‘hoods in the city. Or visit Žižkov, where you can find the most authentic pubs and bars. Tipping is customary here, so don’t be shy and round up if you’ve had great service. Around 10% is considered ideal. So there you have it! 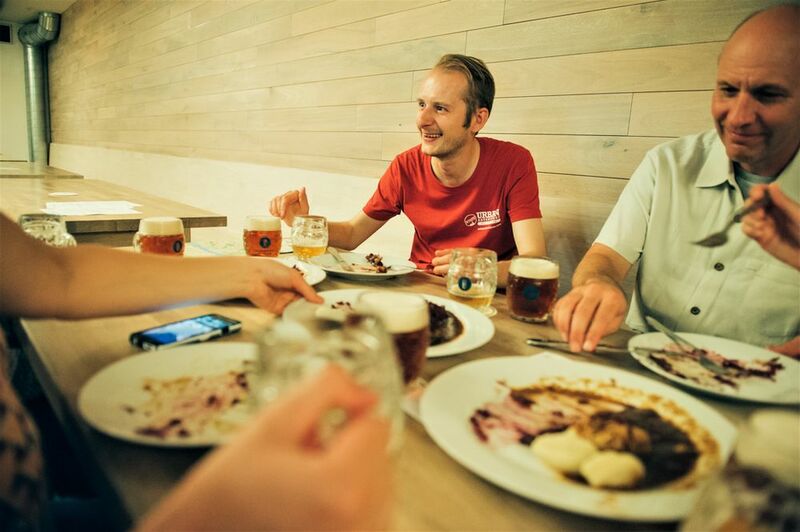 Everything you need to know to experience Prague responsibly and like a local. And of course, don’t forget to hop onto one of our locally-led Prague tours for even more insight into life in Prague.